WGAL's Ed Weinstock recalls getting an exclusive interview with Newt Gingrich, thanks to Gingrich's mom - WGAL Susquehanna Valley Pa.
Newton Leroy "Newt" Gingrich is an American politician from Georgia and author who served as the 50th Speaker of the United States House of Representatives from 1995 to 1999. He represented Georgia's 6th congressional district as a Republican from 1979 until his resignation in 1999. In 2012, Gingrich was a candidate for the Republican Party presidential nomination. Newton Leroy "Newt" Gingrich (/ˈnuːt ˈɡɪŋɡrɪtʃ/; born Newton Leroy McPherson; June 17, 1943) is an American politician from Georgia and author who served as the 50th Speaker of the United States House of Representatives from 1995 to 1999. He represented Georgia's 6th congressional district as a Republican from 1979 until his resignation in 1999. In 2012, Gingrich was a candidate for the Republican Party presidential nomination. In the 1970s, Gingrich taught history and geography at the University of West Georgia. During this period he ran twice (1974 and 1976) for the United States House of Representatives before winning in November 1978. He served as House Minority Whip from 1989-95. 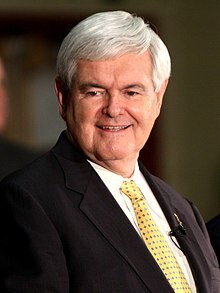 A co-author and architect of the "Contract with America", Gingrich was a major leader in the Republican victory in the 1994 congressional election. In 1995, Time named him "Man of the Year" for "his role in ending the four-decades-long Democratic majority in the House". As House Speaker, Gingrich oversaw passage by the House of welfare reform, and a capital gains tax cut in 1997. In 1998, the House passed the first balanced budget since 1969. In spite of these triumphs, the poor showing by Republicans in the 1998 Congressional elections, a reprimand from the House for Gingrich's ethics violation, and pressure from Republican colleagues, resulted in Gingrich's resignation from the speakership on November 6, 1998. He resigned altogether from the House on January 3, 1999. After being raised Lutheran and spending most of his adult life as a Southern Baptist, Gingrich converted to Roman Catholicism in 2009. He has been married three times, with the first two marriages ending in divorce after he had affairs with other women. He has two children from his first marriage and has been married to Callista Gingrich (née Bisek) since 2000. On July 12, 2016, Gingrich was reported to be on Donald Trump's three-person shortlist to be the presumptive Republican nominee's running mate in the 2016 presidential election, along with New Jersey Governor Chris Christie and Indiana Governor Mike Pence. On July 15, 2016, Trump officially announced that Pence would be his running mate. On November 17, 2016, Gingrich announced he would not be serving in Donald Trump's cabinet but will instead be focusing on strategic planning for the Republican party to build on their victories ahead of the 2018 mid-term elections.